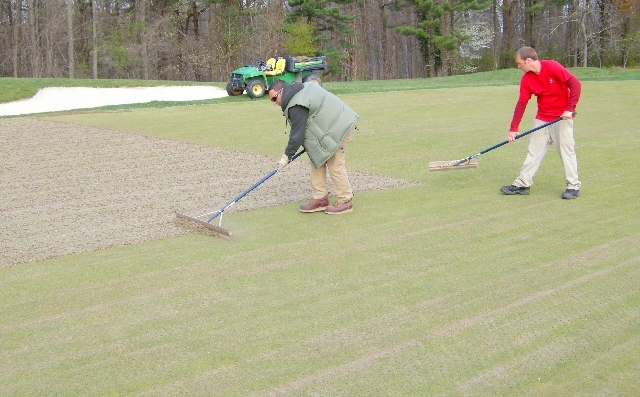 Below are pictures from our April greens aerification. We hope you have a wonderful weekend! Above is our University of Delaware Intern, Tom Senff, aerifying the 5th green using 0.5″ hollow tines on 2″x2″ spacing. 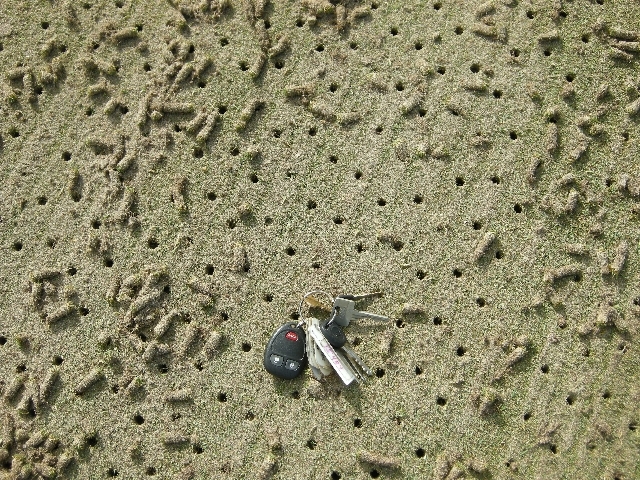 Below is a close-up view of the aerification pattern. The car keys are to give you a reference point for the tine spacing. 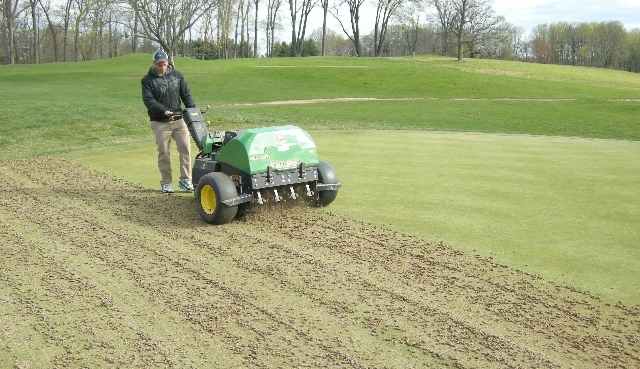 After each green is cored, the plugs are swept into piles and removed. In the picture below are seasonal employees (L to R) Steve Oratorio and Shane Jennings. 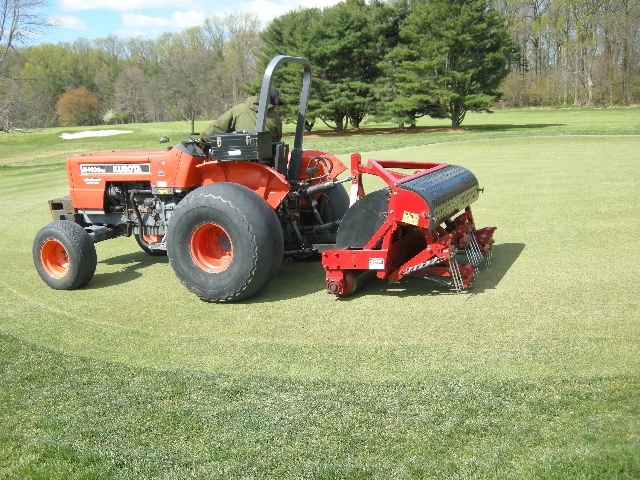 Two days after the traditional coring aerification, thegreens were deep-tine with solid 14 inch 0.5″ tines. Pictured below is a contractor from Aer-Core Inc. on the 3rd green. 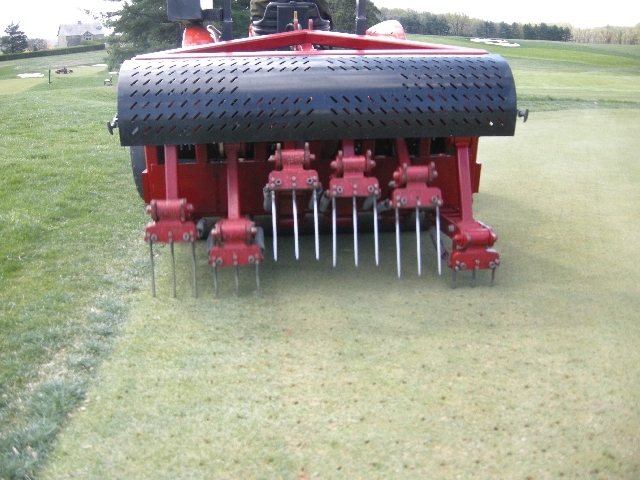 Below is a close-up of the solid 14 inch 0.5″ tines in the 3rdgreen. 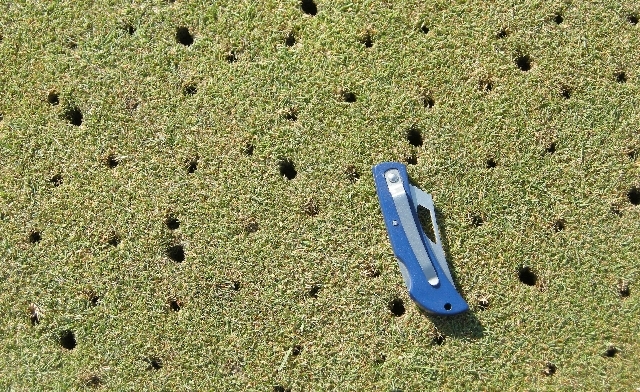 Below is a close-up of the pattern after both the traditional aerification and deep-tine process. 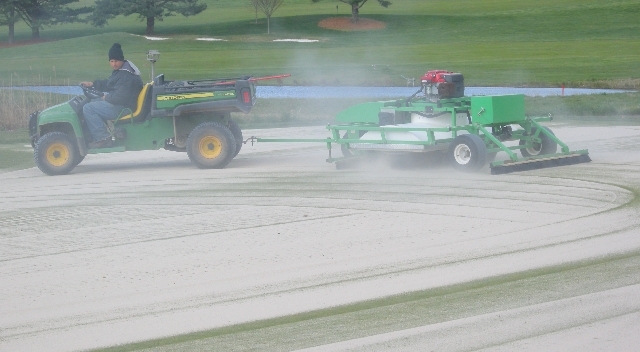 The picture below is a close-up after dried topdressing sand is applied to the greens. 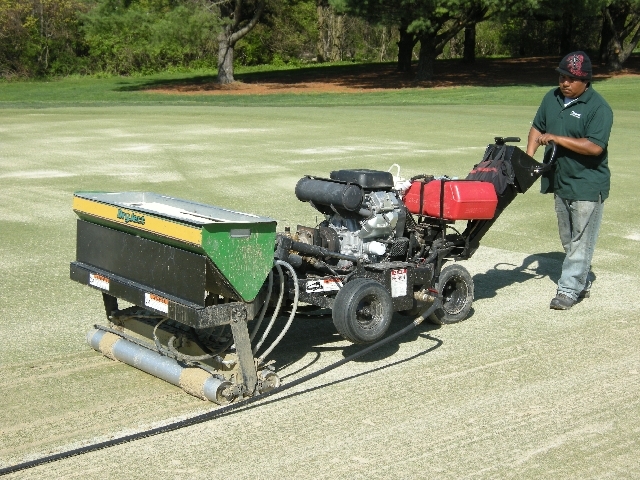 Picture below is 4-year veteran Seasonal Employee Nick Buoni using the Air-Drag on the 11th green. 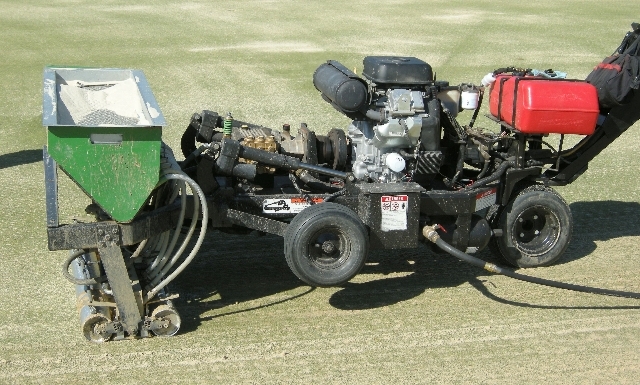 The Air-Drag is a high powered fan used to blow dry topdressing sand into the holes you see in the above picture. 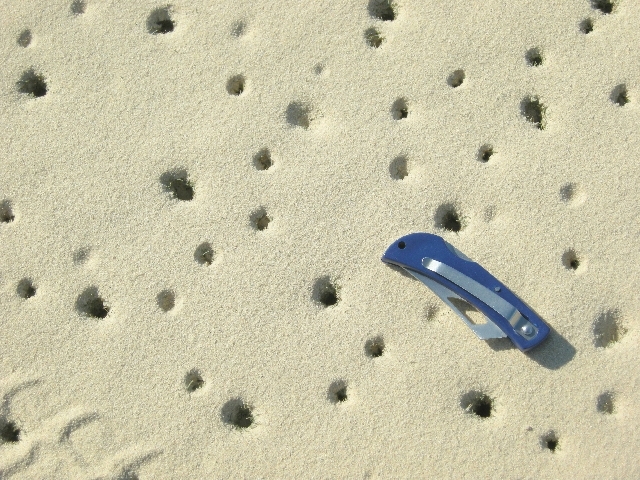 This machine replaced the high intense labor task of hand brooming sand into the holes 6 years ago. Prior to using this machine, it would take 15 staff members 50 minutes per green to accomplish what this machine will do in 45 minutes. Below is the result ofthe Air-Drag. 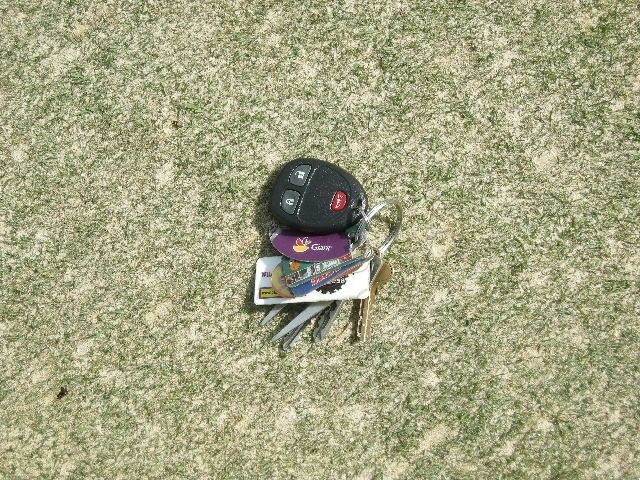 There is a lot of bentgrass peaking through the sand and the sand will provide a firm base for the season. 2 Days after the deep-tine process, our greens and approaches were “dry-jected.” This process shoots high powered water into the soil and injects dry topdressing sand into the sub-surface. This process provides more pore space for roots to grow and also firms the surfaces for smoother putts and approaches that will accept the bump and run game. The 2 pictures below is the contractor from Mid-Atlantic Dry-Ject on the 12th green.